St. Andrew's Wellness Suite Community of Health Education Programs offer organizations the unprecedented opportunity to reach into communities with health prevention messaging and intervention in ways never before imagined. 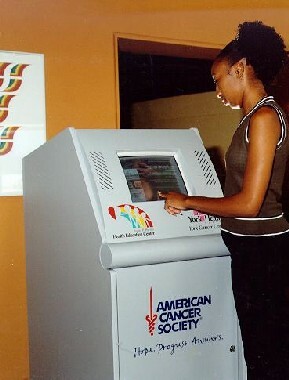 With web connectivity and ease of use, Wellness Suite health education touch screen kiosks offer a one-two punch; web and kiosk access. At St. Andrew our kiosks go beyond the typical definition. They combine delivering credible and captivating health information with HIPAA compliant data collection and retrieval. We vigorously work to encrypt all personal health information yet still make it available for easy retrieval so that intervention and follow up can occur. Wellness Suite offers users never before found comprehensive health data. To learn more about any of the topics in St. Andrew's Wellness Suite community of health education and intervention programs , click on any box below. For our enlightened MAC users or those using non-IE browser software, please go to the list below. Additional information on our products and services below.